In 1980, Dave Duell was scheduled to hold meetings in Kenya, East Africa. At that time, the late Thomas Remi was pastor of the East African Pentecostal Church, Calvary, and Geoffrey Muthinja was the youth pastor. With Dave having great-grandparents from Sweden and the E.A.P.C. having been founded by a Norwegian missionary, it seemed that this was a divine connection. Thomas charged Geoffrey with the responsibility of publicizing Dave Duell's meetings. Geoffrey charged everyone up, showing T.L. Osborne and Billy Graham films and posters and telling them that a similar preacher was coming to town for a large crusade meeting with healings and great miracles taking place! In 1981 Thomas was elected as General Secretary of the E.A.P.C denomination for three years. Dave traveled to Kenya again in 1982 and visited several church districts. Geoffrey was again advertising Dave's meetings in Maua, where Thomas had oversight of 94 area churches. Dave also attended a conference in Nairobi with Walter Olsen and told him, "I will help you fulfill your vision." In 1984 Thomas was elected as the secretary general of the E.A.P.C., but he unexpectedly passed away on December 28 of that same year. Dave paid a brief visit to console Thomas' family in 1985. By this time, Geoffrey was senior pastor of the E.A.P.C. Headquarters. Geoffrey became secretary general of E.A.P.C in 1992-1997 and was re-elected in the same position in the year 2000. He was re-elected again in 2005 up to now. When Geoffrey was in Ohio in 1988 attending college, he planned to visit Colorado and contacted Dave to make arrangements. Geoffrey says, 'I always believed that Dave had a mission to Kenya which he had not completed and I had an urge to look for him! I remember I clearly told him he had a mission in Kenya which he had not completed." Geoffrey lost contact again until one morning in 2002 his receptionist called him and said someone by name Dave Duell was in the office and wanted to see the leadership of E.A.P.C. Geoffrey says, "I spoke with Dave on the phone and told him to wait. I will be there in a short while as I had to walk from my home, which is across from the headquarters. When I arrived, surely it was Dave Duell, Dennis Capra and Bill Kilel." Dave reminded Geoffrey and the leadership of E.A.P.C. of his promise to Walter Olsen. In December 2002, Geoffrey visited Dave and Bonnie in Colorado to invite them as speakers to the 50th Anniversary Celebration of the E.A.P.C. He had no idea that Bonnie had said she would not return to Kenya, but when asked to come and speak, she said yes! Geoffrey says, "When I look back at all this I see great connections from the Lord Himself." 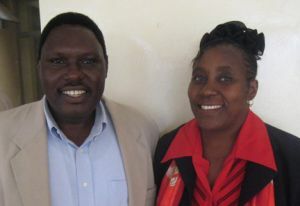 This December 2007, Geoffrey and Ann Muthinja have become FMIN Partners! Geoffrey and Ann Muthinja reminded us of this wonderful timeline, and we agree it is a Divine Connection! We are excited to have Geoffrey and Ann as Network Partners.